Part 1 Understanding older people as consumers of food and beverages: Older people, food and satisfaction with life; Demographic and cultural differences in older people’s food choices and meal patterns; Appetite and ageing; Sensory perception of food and ageing; The social significance of older people’s meals; Gender and food in later life: Shifting roles and relationships; Older people’s consumption of alcoholic beverages: Social significance and health implications. Part 2 Extending functionality into later life: Undernutrition: Diagnosis, causes, consequences and treatment; Ageing and changes in body composition: The importance of valid measurements; Interaction between diet and physical activity in older people; Prevention of Alzheimer’s disease: Implication of nutritional factors; Brain lipids and ageing; Nutrition and bone health in the elderly; Nutrition and immune function in the elderly; Nutrition and gut health in older people; Nutrition and eye-related disorders; Beauty food: Nutrition to support the skin; Nutrition and the metabolic syndrome in the elderly; Fat soluble vitamins and ageing; Water soluble vitamins and ageing; Phytoestrogens and the health of older women; Food-drug interactions in older people; Dietary supplement use in the elderly: Benefits and risks. Part 3 Developing food products and services for older people: Food safety and older people; Developing nutrition education programs for older people; Quality of feeding assistance care in nursing homes; Preparing meals in later life; Designing new foods and beverages for the ageing. The world’s ageing population is increasing and food professionals will have to address the needs of older generations more closely in the future. 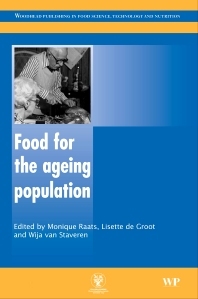 This unique volume reviews the characteristics of the ageing population as food consumers, the role of nutrition in healthy ageing and the design of food products and services for the elderly. Chapters in part one discuss aspects of the elderly’s relationship with food such as appetite and ageing, ageing and sensory perception, food and satisfaction with life, and the social significance of meals. The second part of the book reviews the role of nutrition in extending functionality into later years, with chapters on topics such as undernutrition and conditions such as Alzheimer's disease, bone and joint health and eye-related disorders. Concluding chapters address the issues of food safety and the elderly, designing new foods and beverages for the ageing and nutrition education programmes. With its distinguished editors and contributors, Food for the ageing population is an essential reference for those involved in the research, development and provision of food products for the older generation. Dr Monique Raats is Co-Director of the Food, Consumer Behaviour and Health Research Centre at the University of Surrey, UK.